This was a silly purchase. I was stuck in line at TJ's, and the lady in front of me had an enormous cartload of groceries—a fact I didn't notice until after it was too late to switch lines. I was in the queue for a good three or four minutes just staring at the little table full of goodies next to the checkout. The stuff they have sitting there is pretty slick when it comes to ensnaring unsuspecting victims. My usual strategy involves picking a line with little or no wait and just breezing past them without a glance. But I was stuck. And sure enough, these little guys got me. Sonia and I rarely eat chocolate, and as I've mentioned before, I'm not really a huge fan of dark chocolate. Plus, in the summertime, you have to keep chocolate in the fridge or it gets melty and messy just sitting on the counter. Our AC units hit the bedroom and living room pretty well, but the kitchen tends to be steamy. Furthermore, for some reason I was thinking these were like crunchy sticks somehow. When I hear the word "stick," I think "crunchy." You know, like a stick from a branch on a tree. But these sticks are gummy, which of course makes them even more slimy, gooey, and sticky in this June heat. I could have just gone ahead and read the label on the product I was buying, but well...woulda, coulda, shoulda. Basically, what I'm trying to say is that I wasn't really thinking when I bought these and they were kind of doomed from the start. Popsicles would have been a much wiser purchase. There's a ridiculous amount of raspberry goo on the inside of these things. And I personally don't feel like this particular dark chocolate blends very well with the sweet raspberry jelly nonsense within it. But on the flip side, I must admit that it does taste like raspberry. Not like super sweet fake Jolly Rancher blue raspberry, and not like actual raspberries fresh off the vine, but maybe exactly halfway between the two. Something like a Chambord-flavored jelly candy if you will, but not as rich. It's not bad, it's just not my thing—though I've had higher quality raspberry cordials that I did enjoy significantly more than these candies. Sonia does like dark chocolate, although it's a very infrequent indulgence for her, and when she does eat it, it's in very small amounts. She's less than enthused about these candies as well. She's also not a huge fan of raspberry flavored candy. 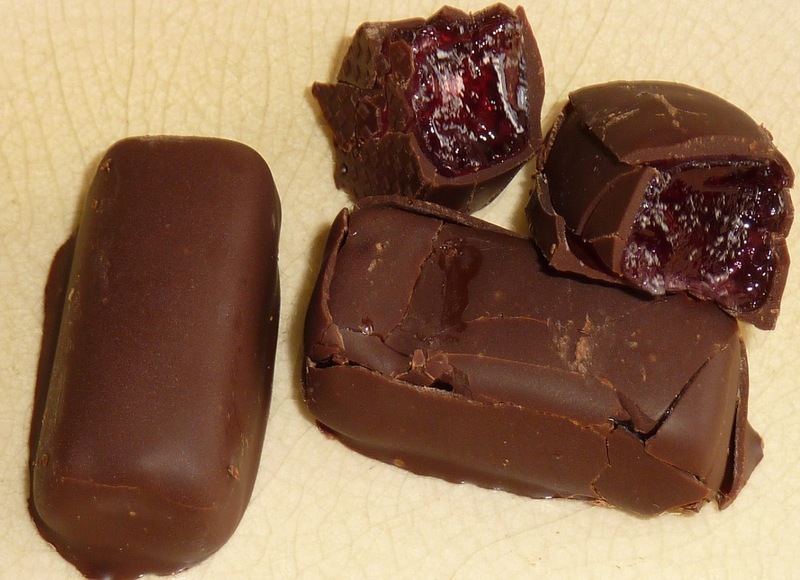 This is one of those instances where our take on a product might be completely different from someone who loves dark chocolate and raspberry candy, so we invite you to share your thoughts in the comments below. I give these "sticks" two and a half stars. Sonia's gonna go with three on this one. I agree. These are not good. The turbinado sugar almonds are a different matter. Russ reviewed those almonds a while ago, but I've never tried them...have to check them out! First two ingredients are sugar and corn syrup. 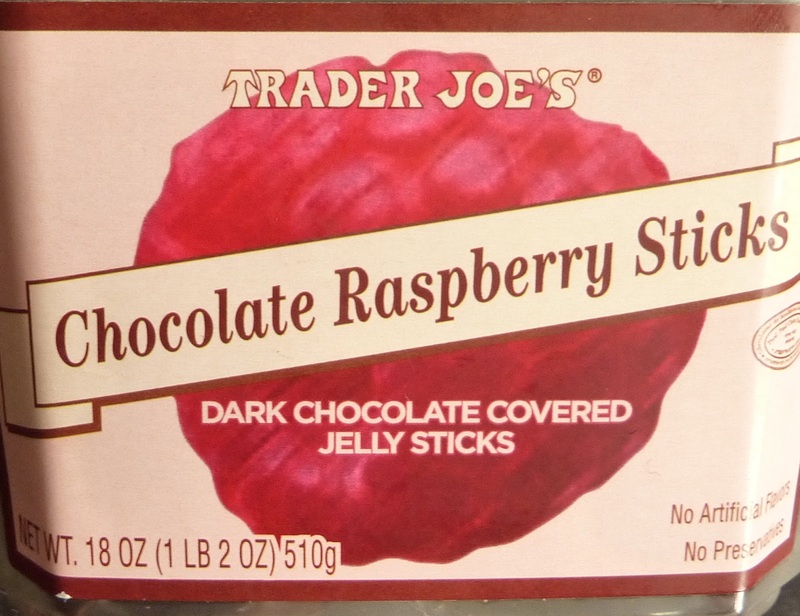 Not worthy of TJ's, Basically jelly candies with superficial chocolate. The orange ones taste a bit better to me, but I quit buying both years ago. Listening to you on the Candyology 101 podcast, and wanted to comment about these. This used to be our family's favorite candy to buy for a special treat. Then several years ago they suddenly tasted horrible. My son still had a container of the good ones, so we compared the labels. The old ones had raspberry puree as the second or third ingredient which was what made them far superior! 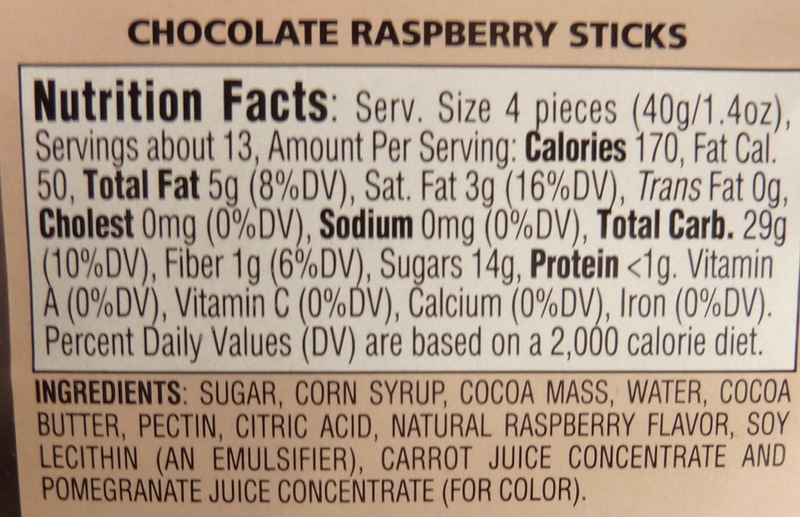 I'm not going to waste either the money or the calories on the current version, but I still check the ingredient label several times a year in hopes that TJ's will change back to the original supplier/recipe. But I'd settle for finding them elsewhere; they were so scrumptious! Great info. TJs does change suppliers from time to time on certain products. I'd love to try the "good" version of these :) hopefully they'll switch back. Glad these were discontinued. Not good at all. Taking up valuable space on TJs shelves!